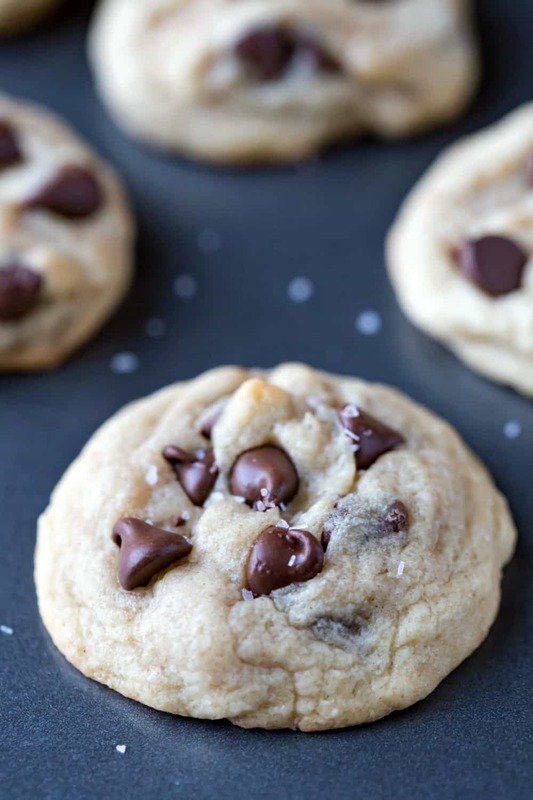 Easiest Chocolate Chip Cookie recipe is a simple chocolate chip cookie recipe that makes super soft chocolate, super yummy chip cookies – no mixer necessary, no chilling needed. Published 8/16/16. Updated with new photos and tips 10/3/18. I’ve made a lot of chocolate chip cookies. A lot a lot. Probably more cookies than I should say. Sometimes, I break out my mixer and make a recipe like my brownie cookie recipe that needs time to chill. Other times, I want cookies five minutes ago. When those cookie cravings hit, I need a simple, easy, go-to cookie that I can whip up in just a few minutes. 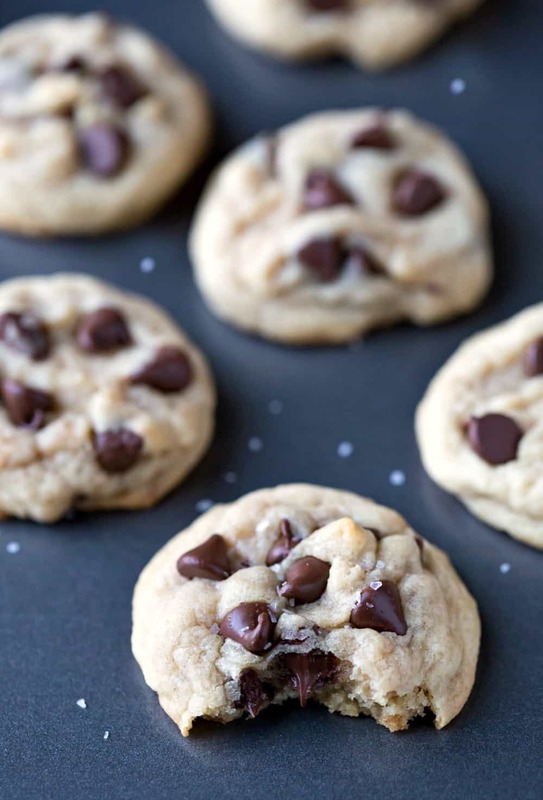 This Easiest Chocolate Chip Cookie recipe is just such a recipe. What makes this the simplest chocolate chip cookie recipe? It uses basic pantry staple ingredients. Also, it is so fast and so easy – no mixer needed, no chilling required – that the cookies can be mixed up and baked in less than twenty minutes. Can I use an electric mixer? Sure! You can use one if you would prefer. Silicone Spatula: A great all-purpose spatula is a must-have. I have two of these spatulas, and I use them for mixing, scraping, and stirring. Mine have held up well, and I like that they’re heat-resistant. Easiest chocolate chip cookie recipe video! 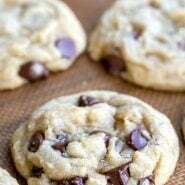 If you’ve tried this easiest chocolate chip cookie recipe, don’t forget to rate the recipe and leave me a comment below. I love to hear from people who’ve made my recipes! You can SUBSCRIBE to receive my latest recipe newsletters or FOLLOW ME on FACEBOOK, INSTAGRAM and PINTEREST for even more delicious food. 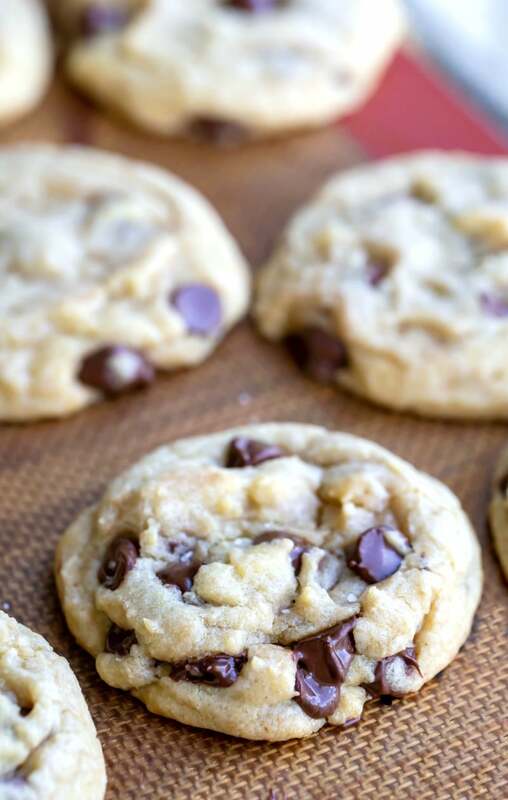 Easiest chocolate chip cookie recipe - no mixer, no chilling necessary. Also, check out the video just above the recipe! Microwave the butter for about 40 seconds. Butter should be completely melted but shouldn't be hot. Add the flour, baking soda, and salt. Please read the recipe note about properly measuring flour. Mix dough until just combined. Dough should be soft and a little sticky but not overly sticky. Scoop out 1.5 tablespoons of dough (medium cookie scoop) and place on baking sheet. Be sure to fluff and then scoop and sweep to measure the flour. Too much flour will result in a dry or crumbly cookie. Don't over-bake the cookies, or you won't end up with soft cookies. Several people have said that they've needed to bake the cookies for longer. Since oven temps can vary, I suggest starting with the listed baking time and increasing the time as needed. These cookie were very easy to make and delicious. Very easy and very good. I’ll be making these again! 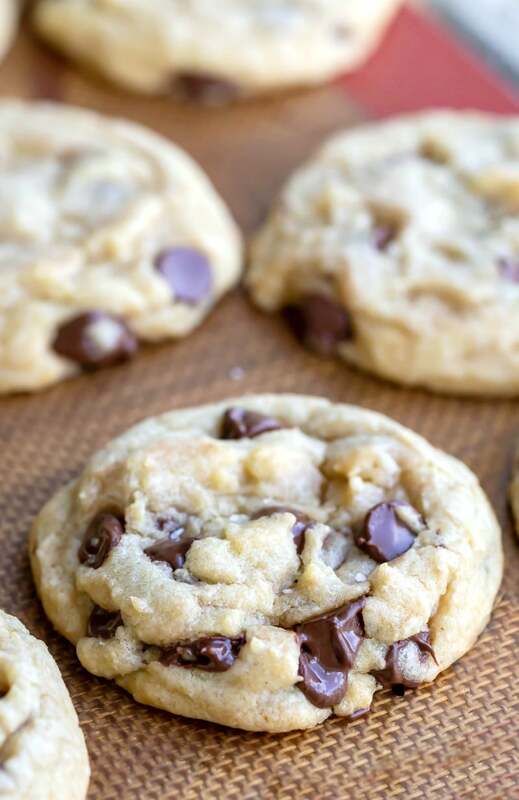 For a chocolate chip cookie, you’ll want the edges to be light golden brown and the centers to be set but still soft for a soft/chewy cookie. If you want a crispier cookie, you can continue to bake for another 1-2 minutes. Hope that helps! Thank you so much! Congrats on your first chocolate chip cookies! I’m glad they were a hit. =) Thanks for coming back to comment! I whipped these up fast and boy they smell wonderful baking! Will be a go to recipe for me!! Thanks so much for sharing! SO I used stevia as my sugar and idk Fr that’s thats hey turns turned how they did, but they didn’t spread? Thanks for the note about using stevia! I haven’t done much baking with stevia, so maybe that’s why they didn’t spread? Congrats on baking your first batch of chocolate chip cookies! =) I’m glad you liked the recipe! Thanks for coming back to comment! As simple as it states, and very tasty! Will be my go to recipe for chocolate chip cookies from here out! Thank you so much! I’m glad you found it to be easy. =) Thanks for coming back to comment! I never leave comments, but I made this recipe after having a HUGE craving for chocolate chip cookies and it turned out great!! We live at 6400 feet and literally every cookie recipe I’ve tried since being here has turned out flat as a pancake. Thank you so much for your recipe!!! I’m so glad that you liked them! =) Thanks for the note about the elevation, too. I know that others will find that to be helpful! I pride myself on being a great baker and I have always been great at making complex recipes but I’ve never been able to successfully make chocolate chip cookies for some reason. However, this recipe was so easy and the cookies came out great! I used mini chocolate chips instead and made my cookies about half the size as yours but they were still wonderful. Great recipe! These cookies turned out fantastic! I first made them yesterday and I just made them again today. Turned out amazing both times. Thank you so much for this recipe! I had to cook mine for about 20 minutes. I’m planning on making these yummy sounding cookies tonight, but unfortunately I don’t have any “Kosher” salt or granulated sugar. Can I just use normal sugar instead? Also, the brown sugar is also finished and I can’t go out. What can I use as a substitute?? Made this for my family just to whip something up….turned out to be some of the best cookies they’ve ever had!!!! ♡ thank you!!! I’m so glad you liked the cookies! =) Thank you for coming back to comment! Any substitute for baking soda? I want to make these now & i only have baking powder.. can i use it instead? Just made these and added a little peanut butter and substituted maple syrup for the brown sugar and vanilla since I didn’t have any and they are perfect! LOOK FORWARD TO MAKING THEM AGAIN! I’ve made these once and they were delicious! Do you know if they are easy to make gluten free? Hi! How are you measuring your flour? I always fluff (stir it up) before I scoop and sweep to avoid packing the flour in. Hope that helps!